circle of what Kempo strives towards. higher level of ability and enlightenment. growth, health, and personal responsibility. of unarmed self-defense, though it encompasses both an armed and unarmed systems of combat with techniques (applications) of varying appearances and methods. On an external level, Kempo is a complete fighting system of offensive and defensive methods, with equal emphasis of striking techniques with the hands and feet, immobilization and controls, projections and take downs; as well as weaponry, various spiritual and healing arts. Kempo, as developed in America, is a street wise defensive art that does not restrict its students in methodology. Clawing hands evolve into slashing feet. Cunning joint locks turn into devastating hip throws. Evasive blocks turn into breath closing chokes. The Shaolin Kempo system we teach contains the 108 number combinations and the techniques of the five animals and the unique forms of Shaolin Kempo as well as the pinan series and weapons defense and weapons training. We place a strong emphasis on body mechanics and control allowing the art to be effective for us as our body grows older. The health benefits of the qi training inherent in the system are powerful, deep and lasting. Shaolin Kempo provides endless possibilities. The only true fighting systems are those where there are no rules applied. From the books of the Han dynasty, we learn "Nothing is impossible to a willing mind." And it is from this saying that we can derive the upper principles of Shaolin Kempo. What sets Kempo apart from boxing, wrestling, and Sunday night football is an emphasis on spirituality of body and mind. The Shaolin Kempo Training Center consciously focuses on maintaining a balance between the soft and the hard aspects of training in the martial arts while teaching and training the students a streetwise effective system. Our family class which allows children and adults to practice together presents a wonderful opportunity for mothers and fathers to enjoy an activity together where they can develop at their own pace and understanding. All adults signed up for the family class also have complete access to the adult classes as they like. The family atmosphere is not limited to the one class though. 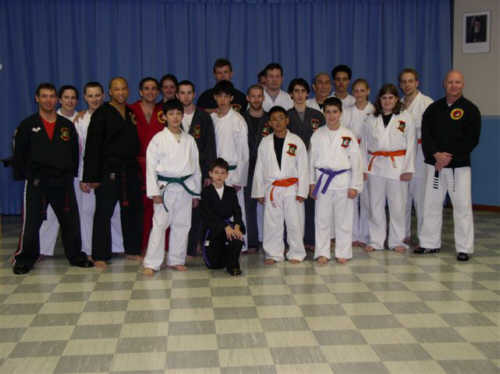 Marlon Wilson's teacher Prof. Ingargiola is a great examples of a powerful and exciting martial artists who loves to share. Marlon Wilson studies tirelessly to learn from Prof. Ingargiola not simply the moves but also, how to teach, how to apply and how to develop true martial artists with Shaolin Kempo. His love for the art and for people permeates the classes and his training. Passionate to learn and teach, Marlon constantly seeks to improve him self and his students and be an example of the spirit of Kempo: “Kempo is the power of adaptability and yielding, the harmony of all things working together.” All the while never forgetting the maxim that there is nothing more harmful than to teach that which is ineffectual.